Christian exodus as Iraqi town falls Jump to media player Thousands of Iraqi Christians are reported to be fleeing after Islamist militants seize the minority's biggest town in the country. Militants 'may use dams as weapons' Jump to media player The BBC's Jiyar Gol reports on fears in Iraq that Isis militants could take control of the country's dams, bringing flooding to communities along the Tigris and Euphrates rivers. New alliances amid Middle East chaos Jump to media player BBC Newsnight's Mark Urban reports on where alliances are being formed amid the Middle East bloodshed and chaos. Tense times in Isis-held Mosul Jump to media player Earlier this week, fighters from the Sunni extremist group Isis blew up a well-known shrine in the northern Iraqi city of Mosul. Iraq conflict: What is a 'caliphate'? Jump to media player Islamist militant group Isis has said it is establishing a 'caliphate' on the territories it controls in Iraq and Syria. LSE's Fawaz Gerges provides context. Moment Isis blew up Iraq shrine Jump to media player Social media footage has emerged purporting to show the Sunni Islamist group Isis blowing up a shrine in the Iraqi city of Mosul. 'Convert to Islam or face death' Jump to media player Isis Sunni militants gave Christians an ultimatum: convert to Islam or face death. Tens of thousands of Iraqi Christians and Yazidis have fled their homes following a warning by Islamic militants to renounce their faiths or face death. A quarter of the country's Christians are reported to have fled after the capture of the minority group's biggest town, Qaraqosh. 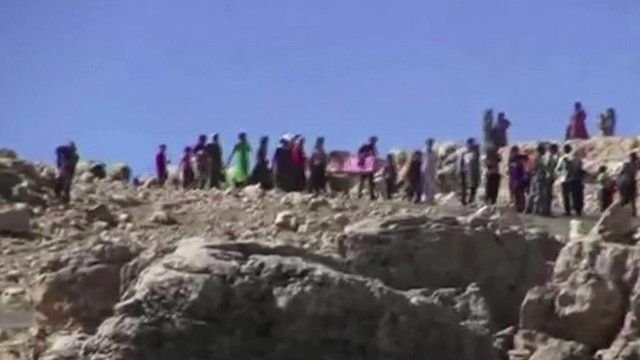 About 50,000 Yazidis were thought to have been trapped in the mountains after fleeing the town of Sinjar. Diplomatic correspondent James Robbins reports.